I love photos so why not add them to the things you see and use every day? Personalized tissue boxes, photo note blocks...even M&Ms can have photos on them now! For Mother's Day this year, we made photo hand soap dispensers and they are super easy to make! 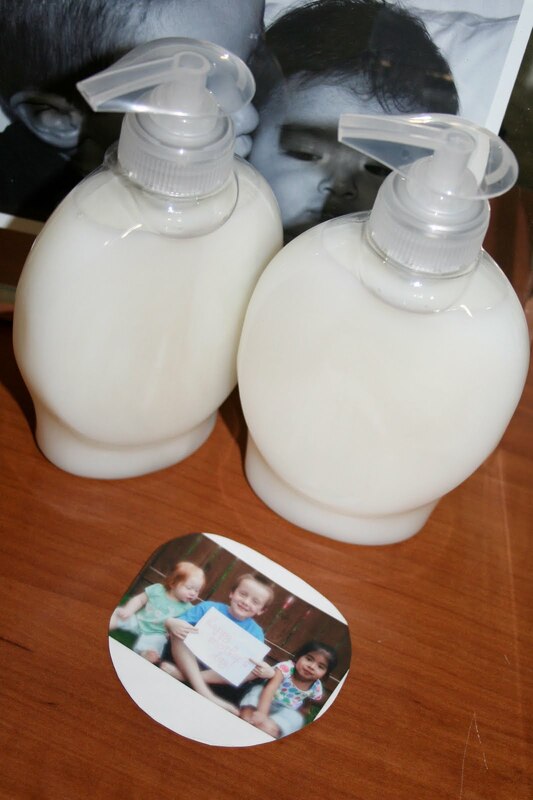 Start by purchasing hand soap in a bottle with a fairly flat label space (our bottle was slightly rounded but the label laid flat very easily). We went with white soap, but you could do clear or any light color so your photo will show. Peel the label off the bottle (our SoftSoap label came off easily) and measure the label. Size your photo to approximately the label size and print on clear sticker paper. Then just place the original label (front side down) on top of the photo, trace around it, and cut out your new label. As you can see above, our photo didn't fill the whole label space but because the sticker paper is clear it looks fine when placed on the bottle. I love the way these came out but am hoping to do them again when the girls are a bit older and use each child's artwork in place of a photo. And I'm also starting to think about other things that lend themselves to a label redo...ideas anyone? Super IDEA! AND your daughter is out-of-this-world adorable--- just saw her BIRTHDAY photos from Tracie!!! !